"Kingdom of the Romans" redirects here. For the earliest period of Roman civilization, see Roman Kingdom. For the title used within the Holy Roman Empire, see King of the Romans. The Kingdom of Soissons in 476. 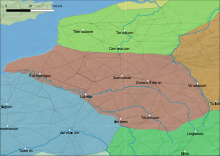 In historiography, the Kingdom or Domain of Soissons refers to a rump state of the Western Roman Empire in northern Gaul, between the Somme and the Seine, that lasted for some twenty-five years during Late Antiquity. The rulers of the rump state, notably its final ruler Syagrius, were referred to as "Kings of the Romans" (Latin: rex Romanorum) by the Germanic peoples surrounding Soissons, with the polity itself being identified as the Regnum Romanorum, "Kingdom of the Romans", by the Gallo-Roman historian Gregory of Tours. Whether this title was used by Syagrius himself, who claimed to be governing a Roman province and not a state independent from central imperial authority, or was applied to him by the barbarians surrounding his realm in a similar way to how they referred to their own leaders as kings is unknown. The emergence of the Domain of Soissons began when Emperor Majorian (457–461) appointed Aegidius as magister militum of Roman Gaul. When Majorian was killed on the orders of Ricimer in 461, Aegidius maintained his own rule in the remnants of Roman Gaul that came to be known as the Domain or Kingdom of Soissons. In the chaos of contemporary Gaul, he maintained his power against Franks to his east and Visigoths to his south; his relations to the Romano-British of Brittany may have been friendly. Aegidius died in 464 or 465. His son Syagrius succeeded to the rule. In 486 Syagrius lost the Battle of Soissons to the Frankish king Clovis I and the domain was thereafter under the control of the Franks. The Kingdom of Soissons originated in the reign of the Western Emperor Majorian (457–461). Majorian appointed Aegidius to be magister militum of the Gallic provinces. The remaining Roman territory in Gaul in the northwest was connected with the Roman possessions in the Auvergne, Provence and Languedoc which connected these to Italy. During Majorian's reign, that corridor was annexed by the Germanic tribes now occupying Gaul, thus effectively cutting off Aegidius and his citizens from the Empire. Majorian and Aegidius had recovered the Roman position in most of Gaul, but with the death of Majorian in 461 the Roman position in the center and south deteriorated. These provinces were annexed by the Visigoths and Burgundians in the years 462-477, which left the remaining Roman territories in Gaul isolated. Aegidius was allied with the Alans, and with Childeric I, king of the Salian Franks of Tournai, and helped them defeat the Visigoths at Orléans in 463. According to Gregory of Tours, Aegidius even ruled the Franks during Childeric's banishment, but Childeric later returned from exile. It is possible that the Groans of the Britons, referring to a Romano-British request for military assistance after the Roman departure from Britain, may have been addressed to Aegidius. Aegidius continued to govern until his death in 464. His comes, Paulus of Angers, was killed shortly afterwards, possibly on the same campaign. At that point Aegidius's son, Syagrius, took his place as ruler. Syagrius governed using the title of dux (a provincial military commander), but the neighboring Germanic tribes referred to him as "King of the Romans"; hence one of the nicknames of his enclave. In 476, under the rule of Syagrius, the Kingdom of Soissons failed to accept the new rule of Odoacer who had dethroned the Western Emperor earlier that year. While both Syagrius and Odoacer sent messengers to the Eastern Roman Empire, the Eastern emperor Zeno chose to offer legitimacy to Odoacer instead of Syagrius. The Kingdom of Soissons cut all ties with Italy and had no further recorded contact with the Eastern Roman Empire. Even after 476, Syagrius continued to maintain that he was merely governing a Roman province. The Domain of Soissons was in fact an independent region. Childeric died about 481, and his son Clovis I became the Frankish king. Clovis made continual war against Syagrius, and in the end took over all his territory. Syagrius lost the final Battle of Soissons in 486; many historians consider this Clovis' greatest victory. Syagrius fled to the Visigothic king Alaric II, but the Franks threatened war if Syagrius were not surrendered to them. Syagrius was sent back to Clovis, who had him executed in 486 or 487. Wikimedia Commons has media related to Domain of Soissons. ^ Bachrach, Bernard S. (1972). Merovingian Military Organization, 481-751. U of Minnesota Press. p. 3. ISBN 9780816657001. By 481 the two peoples competing for predominance in this territory were the Visigoths in southwestern Gaul and the Burgundians in the southeast. Among the lesser groups contending for power were the Armorici (a loose confederation of Gallo-Romans, Britons, Alans, and erstwhile imperial soldiers with their families), who lived in the area between the Seine and the Loire. To the north, between the Seine and the Somme, was Syagrius's Roman kingdom of Soissons and to the east along the upper Rhine were settlements of Alamans. North of these was a small band of Thuringians. The remainder of the Rhineland and the area to the west were ruled by Frankish reguli or chieftains, who, with their warbands, were settled around Tournai, Cambrai, Cologne, and the other cities of the region. ^ Calculated with Google Maps according to the referenced map. ^ MacGeorge, Penny (2002). Late Roman Warlords. Oxford University Press. pp. 111–113. ISBN 0-19-925244-0. Retrieved September 23, 2013. ^ a b c d Penny MacGeorge. Late Roman Warlords. Google Books. ISBN 978-0-19-925244-2. Retrieved 2009-04-20. ^ a b c George Muir Bussey, Thomas Gaspey and Théodose Burette. A History of France and of the French People. Google Books. Retrieved 2009-04-20. ^ Michael Frassetto. Encyclopedia of barbarian Europe. Google Books. ISBN 978-1-57607-263-9. Retrieved 2009-04-20. ^ Lucien Bély and Angela Moyon. The History of France. Google Books. ISBN 978-2-87747-563-1. Retrieved 2009-04-20. Julius Nepos was Western Roman Emperor de facto from 474 to 475 and de jure until his death in 480. He was also the ruler of Roman Dalmatia from 468 to 480. Some historians consider Nepos to be the last Western Roman Emperor, while others consider the western line to have ended with Romulus Augustulus in 476. In contrast, the Eastern Roman Empire and its line of emperors survived this period of history essentially intact. Year 464 (CDLXIV) was a leap year starting on Wednesday of the Julian calendar. At the time, it was known as the Year of the Consulship of Rusticus and Olybrius. The denomination 464 for this year has been used since the early medieval period, when the Anno Domini calendar era became the prevalent method in Europe for naming years. 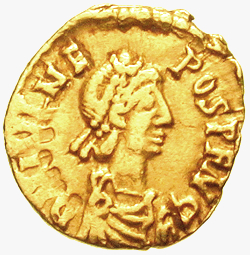 Libius Severus, also Severus III, was Western Roman Emperor from November 19, 461 to his death.